It’s time to look at a Digimon game that I’ve kept on the backburner for quite a while. This one sounded pretty interesting at first since you could have the Digimon fight each other in real time combat. The problem was that this isn’t the case at all. It’s actually a computer fighting game. By that I mean that the A.I. control the Digimon in combat and all you do is look out for them. It’s a similar mechanic to the Digimon World series, but to a much harsher extent. It’s a game that gets better as you play it, but ultimately you just feel like it’s a bit of a waste. It’s a game that could have been significantly better. There is no plot here so we can get right to the meat of the game. Naturally that is the tournaments. The game runs on a calendar system (Which is always a terrible idea) so as you play the in game timer moves on. Each hour seems to pass by in about a minute or less. You’ll be running through the days which have no end. There are 4 seasons in the year and they keep on repeating. The first thing you need to do is catch some Digimon. You do this by going into the hunting ground and using your rope to catch them. It’s similar to the Pokemon Ranger system, but a little more tedious and annoying. This is because the Digimon tend to break free of the rope and run away. The screen isn’t always very responsive either so good luck chasing them. Still, eventually you’ll get the Digimon you want. If you want to catch stronger ones then you’ll need a better rope, but for that you need money. You get money by winning fights. These can either be Title Fights, Free Fights, or Championship bouts. Don’t worry about the final category since you need a team of Megas to even attempt such a thing. Title Fights is where I spent 90% of my time but Free Battles is a great way to get started. Once you finally get your Digimon you have to realize that this is quite the responsibility. Your Digimon need food to eat and they need it at least once a day. They also do their business all over your cages so you have to keep cleaning them or the Digimon feel bad. They catch colds if you don’t put them in the Medical corner too often and they can’t handle 2 attributes at once. This means that if you are increasing their attack power you are weakening their defense and vice versa. The game is made so that there is always a catch which makes training take forever. Whenever you actually have a spare moment you’re expected to run to the store and buy more food and bandages since the Digimon go through them so quickly. They also get depressed for no reason and if they get scared in combat they will refuse to attack. This is always terrible since your Digimon may be strong enough to win, but doesn’t feel like he can so he won’t even try. It’s just such a terrible mechanic and it’s why I rarely like to leave it all in the hands of the A.I. Well, somehow or other you will finally get around to getting involved in Title Fights. At first your Tamer Rank is 1, but the more medals you earn from these Titles, the more your rank increases. As your rank increases you’ll be able to buy a lot of extra items to make everything easier. It’s made to be one of those games that really encourages you to just keep playing. Get over the initial hump and you’ll really be ready for success. The first few battles are tough, the middle ones are easy, and then the last ones are tough again. I made it all the way to Tamer Rank 5 and won about 20 Titles so I figured that was good enough for the review. Towards the end the tournaments started having a lot of unnecessary conditions like “Only Rookies allowed” or only Holy Digimon allowed. If you don’t have one then you’re sunk since it means training one from scratch or catching it in the wild. Often times these fights are 3 v 3 so you would need to get 3 more. The problem is that you can’t keep too many Digimon in the cage with you or you’ll run out of space. You can see why the game is so frustrating. Naturally the game also brings back the concept of your Digimon dying. When that happens they are turned back into an egg and you have to start the training back from scratch. Why even put something like that in the game right? It’s a big thing that is in a lot of Digimon games and ultimately ends up holding them back. I just don’t think that it’s a good idea and it makes you not want to invest too much time into any partner. From the start I decided I would stop either when I got enough titles or when my Digimon died. The former happened first, but I was definitely getting close with my guy since he’s been with me for around 3 years I believe. The graphics aren’t bad. They’re fairly zoomed out though and don’t look as good as the average mobile game. It takes a lot for me to say that a game looks bad, but I will concede that it is well below average. You could easily make a game that looks better than this one with just about any company’s budget. The looks aren’t that important, but it doesn’t set a good first impression. As for the soundtrack, it’s as bland as can be. There are only a few themes and none of them are particularly noteworthy. At least they’re not bad though. As for replay value, the game technically has a lot there. With your Digimon constantly dying or needing your attention, you could play this game for many hours. That being said, I don’t imagine that you would have a ton of fun with this so I wonder how long you would last. This is probably the weakest Digimon game yet which is unfortunate. Hopefully the Digimon World series is basically over or gets an overhaul since it just doesn’t seem to hit the right notes. Only Digimon World 4 seems to have been really well made and that one was a radical change from the others. Overall, Digimon World Championship will test your baby sitting skills. It’s basically the only way to keep the Digimon in line. I’ve ranted about the game long enough though. It still isn’t a bad game and I did have fun grabbing the titles once I got more powerful Digimon. The problem is that in order to get all of the titles you would have to repeat this process many times over which is just something that I wouldn’t plan on doing. Even when you have a strong enough team to win, a large part of the battle depends on luck and the whims of the A.I. I just don’t think that would work for me. If this sounds like your cup of tea then by all means go for it. It’s definitely a fairly unique game I suppose. This entry was posted in 5 Star Games, Game Reviews, Games, Reviews and tagged Action, Digimon, Digimon World Championship, Digital Monsters, DS, Game Review, Nintendo, Review, Strategy, Turn Based Combat, Video Game Review, World Championship by dreager1. Bookmark the permalink. It’s not something I’d have any interest in playing, but it sounds more like work than a game! I feel like Digimon games were always unpopular while everyone loved Pokemon games and Digimon anime. I feel like Digimon games don’t get played by enough fans, i think that they are seriously fun. 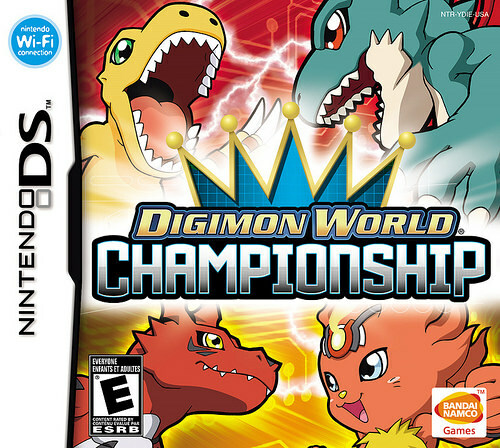 Honestly, i wasn’t a huge fan of World Championship, but at least we have World DS which is a really fun Digimon game with lots of cool and cute Digimon and it’s easy to play. True. I guess it’s because Digimon is more difficult than Pokemon series, but that’s what i like about Digimon. It had some enjoyable spin-off games too, suich as Rumble Arena , and its sequel, which were really fun. Most of people care about anime when it comes to Digimon, but Digimon franchise has some really fun games too. Yeah, it’s pretty different from Pokemon games. Both are fun honestly. I really liked Digimon Rumble Arena 2, but i didn’t mind it not having Ultimate Digimon, it was easy to play and really fun. It’s like Super Smash Bros, but with Digimon which is cool. Me too, Rumble Arena 3, not All Stars Rumble. It would be pretty cool and maybe even better than All Stars Rumble since i saw that most of people disliked it. It would be cool if Rumble Arena 3 includes Data Squad Digimon, since Rumble Arena 2 had Frontier Digimon as playable characters. Yeah, I think All Stars Rumble was a good attempt at a 3D Digimon game, but it didn’t have as much lasting appeal as one would hope. I think part of the problem is that the story is a little too long and repetitive compared to what it should have been. As a result by the time you are done with it and ready for the multiplayer you’re a little more burned out. I definitely agree that we should get some Data Squad fighters in as well. Yup, it would be neat if Digimon Rumble Arena 3 had Data Squad characters, especially if they make black versions of them. And maybe would even make Digimon popular, i would love to see a real Digimon fighting game. Definitely, that’d be hype. I think there would definitely be a market for it as well. I’d certainly buy something like that day 1. Yeah, and maybe even fighting games would love the serious Digimon fighting game. If Pokemon got a fighting game (Pokken), i don’t see why Digimon can’t. Yeah, it would be awesome to see a serious Digimon fighting-game for once. If Dragon Ball Z can get one, if Pokemon can get one.. I don’t see why Digimon can’t get a serious fighting game.